After four days in Istanbul, we headed to the islands: Santorini and Crete! We opted to skip Athens entirely (except for our layover), since we'd both been. And, to be honest, it's not one of my favorite cities on the planet. I had been to Santorini once before with my parents and my friend Kate, after we finished our study abroad semester in Paris. But the Greek islands in general, and probably Santorini most of all, is a place for couples, so I was excited to go with Mike. We knew we wanted to stay in Oia, since the prettiest views, most of the best hotels and tastiest restaurants were all centered there. 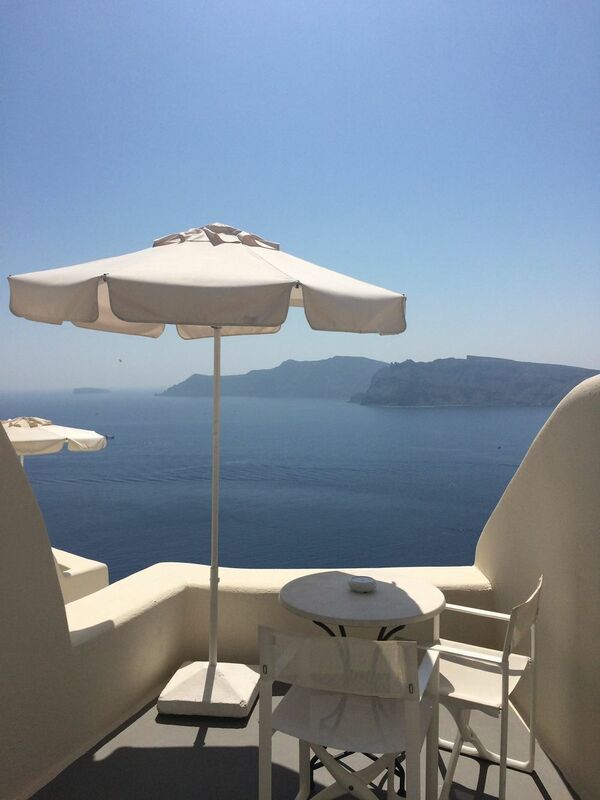 After chatting with our ever-diligent travel agent Josh, we decided on Canaves Oia Suites. We LOVED our hotel. As you can see from the above photo, the view was outrageously beautiful and we even had our own outdoor hot tub (which, sadly, was off limits for me and Baby Lewin, but I liked knowing it was there). The main street of Oia was basically outside our door, which made getting to all of our meals very easy. And, other than a boat trip, we stayed put in town and were perfectly happy. Gyros. Maybe it was just because I was hungry, or maybe it was because it truly was the platonic ideal of a gyro, but this was one of the best sandwiches I've ever had. This gem was from Niko's Place, where we heard most of the locals went. I thought that by hitting Greece in early September the weather wouldn't be oppressively hot, but we were a bit off in our timing. It was still about 95 degrees with no cloud cover during the majority of the day, so we took the heat as an opportunity to take a lot of naps, catch up on reading and generally just laze about, which is NOT something you'll generally find us doing on vacation. It was a welcome change, though. And, clearly, we ate a lot. If you go to Santorini, don't leave without trying pureed fava beans, which is something of an island specialty. The best version we had was at Roka, where we went for dinner our first night. Everything we tried there, from the octopus to the shrimp was outstanding, but their version of fava had caramelized onion on top that really set it apart. Another Greek food item that I was excited to eat multiple times a day was Greek yogurt (obviously, #basicbitch). Across from our hotel was a coffeeshop that served breakfast in the morning and a lot of oontz-oontz at night. This parfait with nuts and honey was nearly perfect. Our one foray out of town was a boat ride around the island, which the hotel booked for us through Sunset Oia. As it was so hot, the ocean water was perfect for swimming and you won't find much clearer waters in any part of Europe. And surprisingly, the BBQ lunch on board was one of the best meals we had the entire time on the island. The rest of our time on the island was basically spent chowing down (on pastries, baklava, fresh fruit, moussaka...) and taking pictures of the ocean. One low point? Santorini was definitely more crowded than the last time I went, in 2006. Especially when everyone crowded to the lookout point to see the sunset, it was a bit overwhelming. But other than that, it certainly maintains its reputation as one of the most romantic and beautiful islands in all of Greece.